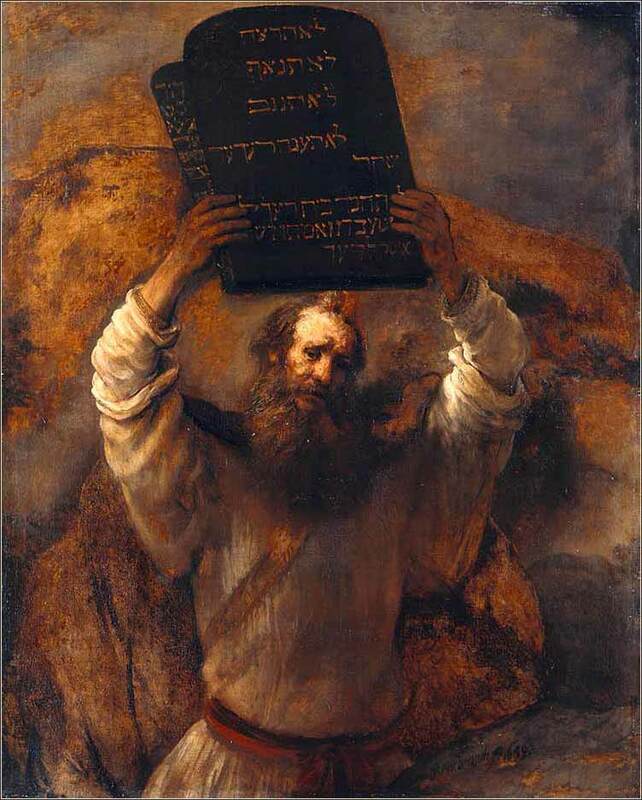 Moses with the Ten Commandments, Rembrandt van Rijn ca. 1659. From the brush of the master, one of the most powerful images in Western art: Moses, seeing the Hebrews worshiping the golden calf, raises the ten commandments to smash them on the rocks. 203 people in our community are currently praying with you. Donnie McLurken sounds very much like Cat Stevens in his lower register. This contemporary worship song is very inspirational. Through grace let my will respond to You, knowing that power to obey is not in me, but that Your free love alone enables me to serve You. Here then is my empty heart, overflow it with Your choice gifts; here is my blind understanding, chase away its mists of ignorance. May God guard me and all of us, and keep us in safety and comfort and in health and strength, sending us nothing but good. May God, if it is His will, shower down so many blessings upon us that the day is not long enough for them all! Christ Crucified by Diego Velazquez, ca. 1632. 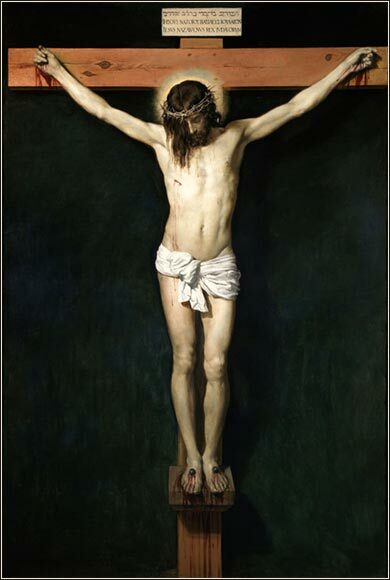 This is perhaps the finest, or at least the most famous, of all the thousands of depictions of the crucifixion. Then Moses turned and went down from the mountain with the two tablets of the testimony in his hand, tablets that were written on both sides; on the front and on the back they were written. The tablets were the work of God, and the writing was the writing of God, engraved on the tablets. And as soon as he came near the camp and saw the calf and the dancing, Moses' anger burned hot, and he threw the tablets out of his hands and broke them at the foot of the mountain. He took the calf that they had made and burned it with fire and ground it to powder and scattered it on the water and made the people of Israel drink it. We see, first, that the ten commandments are inscribed on both sides of the stone tablets, front and back. We forget this, sometimes, because for the sake of presentation, they are depicted as inscribed on the front. Even odder, the entire text was probably inscribed on each tablet — Moses had ”an original and one copy’ — for this was the common practice of the time, to make an original of a writing to be kept in official storage and a copy to be read by the people. But perhaps not, for we know that both tablets were kept, unseen, in the Ark of the Covenant. Moses, who has already been told by God what has happened, is able to identify the noise he and Joshua hear as they come down the mountain. When they come near the camp and can see the scene, Moses becomes angry and breaks the tablets. Was this a spontaneous outburst, or had Moses formed a plan to break the tablets in advance? It was certainly a bit of theater meant to impress the wayward Hebrew revelers, a glass of ice water in their face to break the momentum of the festivity. Either way, the action vividly symbolized the seriousness of the idolatry and impressed the fact on the watchers' minds, that their sin could completely destroy their protected relationship with Yahweh. God has been patient with the Hebrews, but the time has come for them to start taking obedience seriously. It was common practice for conquerors or rulers to grind statues to dust and scatter them across land, so that they were destroyed utterly, beyond recomposition. The golden calf was, remember, primarily made of wood and thus burned easily. But Moses goes beyond the usual scattering and puts the dust into the water supply, so that it will be eaten by the Hebrews. The material of the idol thus ends up in the most demeaning place possible — at the bottom of a latrine. In the account Aaron gives to Moses, many commentators see some coloration of defensiveness and self-excuse, on the one hand, or confession, on the other hand. But, really, he almost parrots the preceding verses describing how the idol came to be made. He simply tells Moses the truth. Without doubt, Aaron should have stood his ground and opposed the Hebrews who wanted to ignore the Word of God; he was, unfortunately, the first of many Jewish and Christian leaders to give way to a majority in the wrong. The scene is our first view of how destructive church politics will become. The pressure on church leaders from wrongminded congregations, who dislike or do not agree with the clear teachings of the Bible, has been with us ever since. God's Word is not determined by popular opinion or majority vote. John 14:23-24: Those who love me will keep my word, and my Father will love them, and we will come to them and make our home with them.